Sadly for IHOP habitués, this was not in fact the case, as the bartender amusedly clarified for me. Happily for home pancake makers, that doesn’t mean we can’t make such a thing ourselves. The Old-Fashioned is surprisingly divisive for a drink so classic in the cocktail repertoire. Pretty much the only thing anyone can agree on is that whiskey, sugar, and bitters are involved. Some use sugar cubes; others squirt in simple syrup. Some like bourbon; others, rye. Some eschew all garnish; others begrudgingly allow a single orange peel, while still others go whole hog with orange and lemon wheels, cherries, and even pineapple. Heck, there are some people who are cool with taking the drink neat instead of over the rocks. I’m firmly on the side of garnishes when it comes to the Old-Fashioned. And for the purposes of making pancakes (sing it with me: making pancakes, making whiskey pancakes! ), they’re a definite necessity. Chopped maraschino cherries and fresh orange zest brighten up the batter—trust me, even if you’re not a maraschino cherry fan, do yourself a favor and seek out the good ones for this recipe. They make all the difference here. The batter’s also spiked with a little rye flour to pay homage to the alcohol that makes up the base of a classic Old-Fashioned (most bourbons contain rye, though there are always exceptions. Let’s just roll with it here, ok?). And for the final flourish, a splash of Crown Royal maple whisky adds a hint of booziness to the syrup without killing your brunch guests with high-proof vapors—again, trust me, as someone who once accidentally used Scotch in her bourbon French toast, the maple-finished whisky is the right and only move here. The end result is a sweetly unexpected and distinctive variation on the traditional pancake breakfast that toes the line between old-fashioned and, well, Old-Fashioned. Note that I do not recommend drinking actual Old-Fashioneds with these pancakes unless you want to lay yourself out flat for the rest of the day. May I suggest a light breakfast cocktail like an orange juice shandy instead? Whisk the flours, sugar, baking powder, and salt together in a large mixing bowl. Set aside. Whisk the milk, egg yolks, butter, orange zest, vanilla, and bitters together in a medium mixing bowl. Set aside. With a stand mixer or handheld electric mixer , whip the egg whites until soft peaks form when you pull the beaters out of the eggs. The egg whites will still be droopy; don’t overwhip! Stir the milk and egg mixture into the dry ingredients just until combined—there can be a few pockets of dry flour left in the batter—then gently fold the egg whites into the batter. Heat a griddle or a large, heavy skillet over medium heat until very hot and sizzling. Grease with butter if using a cast iron or steel pan. 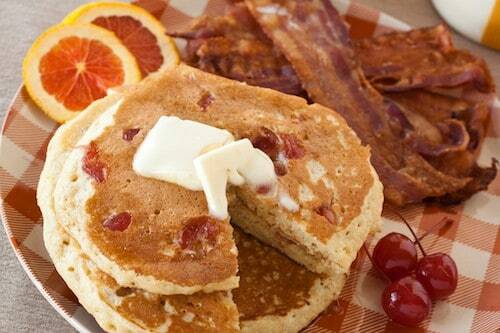 Drop pancakes in 1/2 cup (4 oz.) 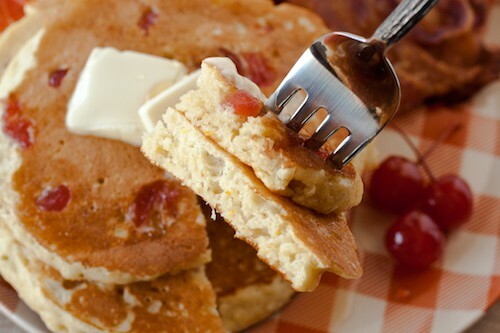 ladlefuls onto the griddle and sprinkle evenly with handfuls of minced maraschino cherries. Cook the pancakes until you see bubbles form on top and the sides start to become matte and firm instead of glistening and liquid. Peek under the pancake to see if it’s golden brown, then carefully flip. Cook for a minute or two more and remove from the griddle. Repeat with the remaining batter; pancakes can be kept warm on a baking sheet in a 200˚F oven if you want to serve all the ‘cakes at once. Whisk the maple syrup, whisky, and maraschino cherry juice together in a small bowl. Warm gently over low heat if desired (don’t let the syrup boil! ), then transfer to a small pitcher. There’s so much butter in these pancakes you don’t really need to serve them with butter on the side, but my husband still considers that blasphemy—he also blankets his pancakes with powdered sugar for good measure. 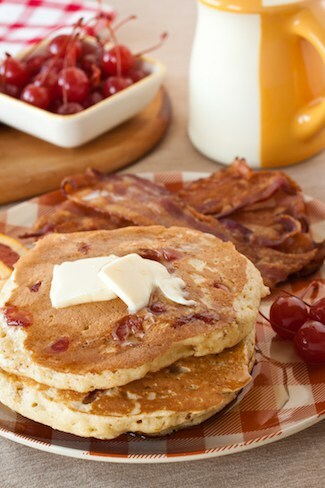 Any remaining unbuttered, unsyruped, unsugared pancakes can be frozen in a single layer on a rimmed baking sheet, then stored in sealed freezer-safe bags for up to 3 months. Reheat in a dry pan or in a toaster oven. 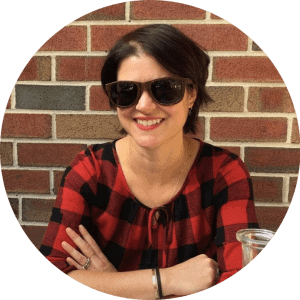 Casey Barber is a food writer, recipe developer, photographer, and illustrator whose work has appeared in TODAY Food, The Kitchn, ReadyMade, Gourmet Live, DRAFT, and other publications. Casey is the author of Pierogi Love: New Takes on an Old-World Comfort Food and Classic Snacks Made from Scratch: 70 Homemade Versions of Your Favorite Brand-Name Treats as well as the co-writer of Inspired Bites: Unexpected Ideas for Entertaining from Pinch Food Design. She is also the creator of the popular line of Hamilton-inspired pins and cards, available at The Casey BarberSHOP. FTC Disclosure: Good. Food. Stories. is an Amazon.com affiliate and receives a minuscule commission on all purchases made through Amazon links in our posts. If you'd like to support the site further, please use this link or click the Amazon links in the sidebar to make your purchases.